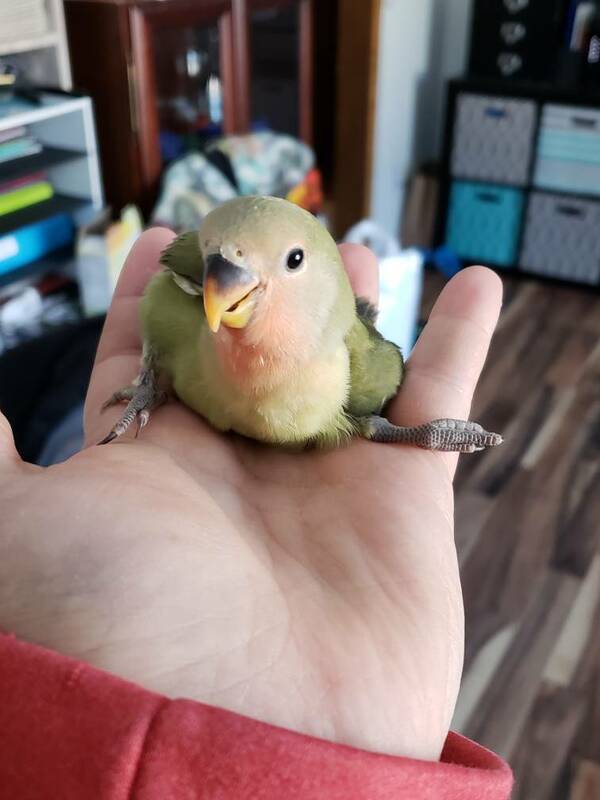 Squish is a 4-5 week old peach face lovebird that has some rather severe physical deformities. We're not sure if it's a really bad case of splay leg or something else. His spine curves into an almost S shape and his left leg sticks way out in front of him. But to just watch him, he obviously doesn't know anything is wrong. He wanders around the bottom of his new cage, is starting to climb up onto the food dishes and the hammock. Loves to be held and cuddled but will definitely let it be known when he's had enough. For now he's able to eat and has normal poops so his spine issue doesn't seem to be affecting his digestive system at least. As he gets older, we'll take care of any issues that arise as long as he wants to fight we'll fight with him. Oh that little one is precious! Absolutely no wonder he stole your ❤️! There is a lot a knowledgeable a sin vet can do to help the leg. But you need to do it now while young and still growing. Very cute baby! ! 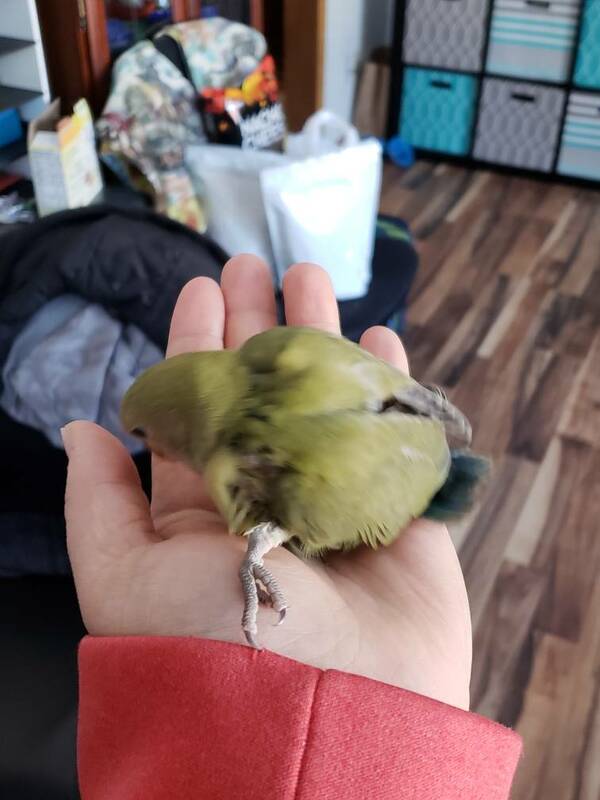 I can take him up to the UW Madison vet hospital, but I know from experience with Bo, my amazon, that they really prefer not to stress chicks by taking blood and doing excessive testing on them until they are weaned unless it is a life or death situation. Because of the rather extreme curve in the bottom half of his spine, right around his pelvic region, I want to have blood tests done, especially checking organ function, before his leg is addressed. I wouldn't want to stress his internal body more than it can handle trying to fix the leg by not knowing exactly what is going on. Squish is darling! I’m glad he’s in good hands, I hope his issues can be treated and corrected when he’s a little older, for now he’s absolutely precious. Nope, Squish has no idea anything is wrong, huh? Well, hey, he has a loving home, a great smile, and a fabulous name! Bless you for making his world right. Oh my goodness, my heart is melting. I'm in love with your Squish. Not only is he adorable, but so is his name & so appropriate! That lovebird is adorable and you can see how happy he is in your hand. Last edited by ParrotGenie; 01-27-2019 at 02:18 PM.